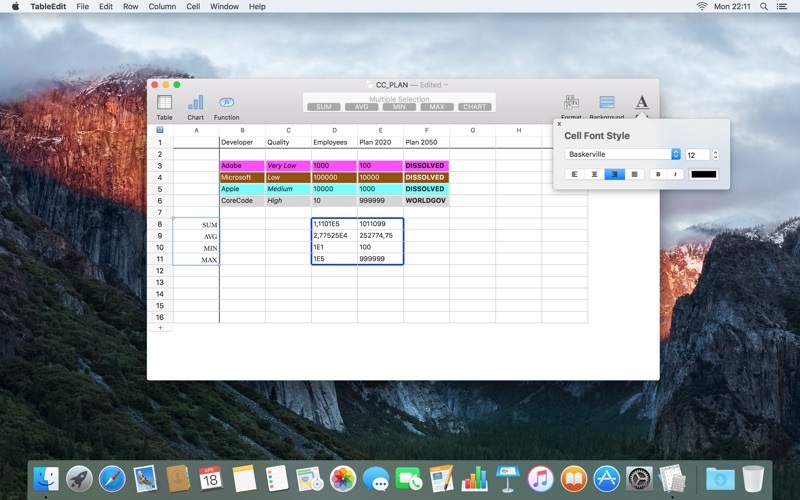 TableEdit is a simple, clean & elegant spreadsheet application designed specifically for the Mac. TableEdit features a minimalistic yet intuitive interface and has convenient features like formulae, charts and exhaustive cell styling options as well as comprehensive import & export options. TableEdit has been designed from the ground up to be a simple, fast and convenient spreadsheet. Unlike cross-platform competitors we natively support Mac technologies like autosave, document versioning, iCloud and many more. Navigating and selecting works just as expected in any real Mac-app, with keyboard shortcuts and modifier keys having their usual effect. The defining element of the interface is the toolbar which gives access to the most commonly used options as well as the ‘main cell editor’. The main cell editor always displays cell contents unmodified by formatting options or formulae results. The main cell editor also provides easy access for inserting common functions like SUM. You can easily select background colors and define the cell border options. There are also exhaustive text setting including color, font and alignment. Alternating row background colors are also supported on a global or per-spreadsheet basis. All these options can be conveniently accessed directly from the toolbar. TableEdit has many options for controlling how cell content should be displayed in the table. You can opt for customizable date and time formats. Even more options are available for number display- you can control the number of digits, separator, choose scientific or currency display. Or you can go all the way and use the freeform “custom” representation for numbers. Our world class excel-compatible formula implementation has been tested on over a million formulae and works with the most complex imaginable formulae. In the formula-system there is support for more than hundred of the most-used excel functions. In many cases you can just import a excel file and the formulae will carry over and work as expected. Note that only basic functions like ‘SUM’ are available in the base version of TableEdit, advanced functions require an in-app purchase upgrade to ‘TableEdit Pro’. TableEdit supports different charts and graphs to visualize your data. You can currently select from pie-charts, bar-charts and line-graphs and define colors, styles and various options. You can move charts freely around your document and export them directly to PDF. 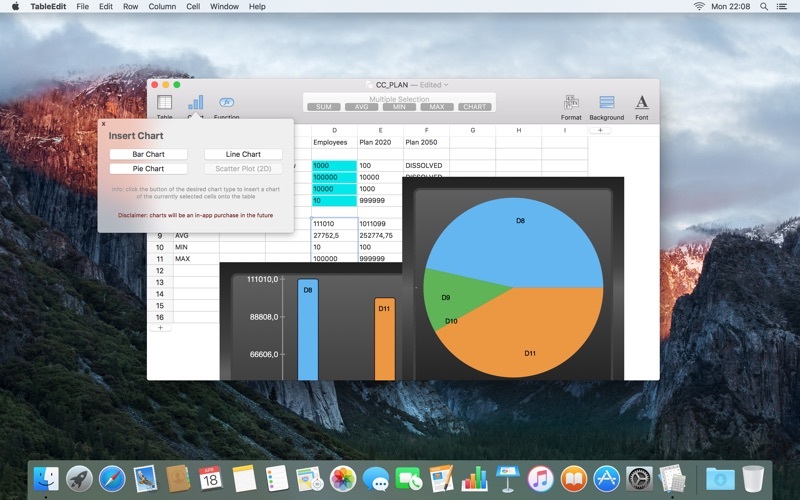 Note that only the basic bar-chart is available in the base version of TableEdit, advanced charts require an in-app purchase upgrade to ‘TableEdit Pro’. You can either import CSV and Excel files quickly via drag&drop or use the Import-panel to select more options like the separator or encoding. Exporting to Excel (classic or XML) is also just a mouse click away. TableEdit is still a ‘young’ spreadsheet but we have a comprehensive roadmap for future improvements. Please let us know what you need so that we can prioritize development and make TableEdit just-right for you!